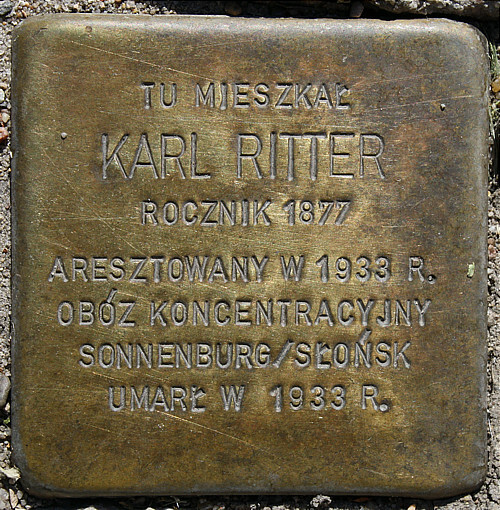 Karl Ritter (1877 - 1933) lived in the Frankfurt district Dammvorstadt, today S?ubice/Poland (former Holzhofstraße18). He learnt to be a cartwright and worked in his parents' business "Handwerkbetriebe Hufschlag & Wagenbau". Ritter was a union official in the German Woodworkers' Union and probably a member of the Social Democratic Party. In March 1933 he was imprisoned for a time after saying unpleasant things about National Socialists in a pub. On 2 May 1933 he was imprisoned again for organising a protest march, in the concentration camp at Sonnenburg (today Słoñsk/Poland). In the late summer of the same year he took his own life there. Witnesses suppose, however, that he died of the consequences of torture in custody.